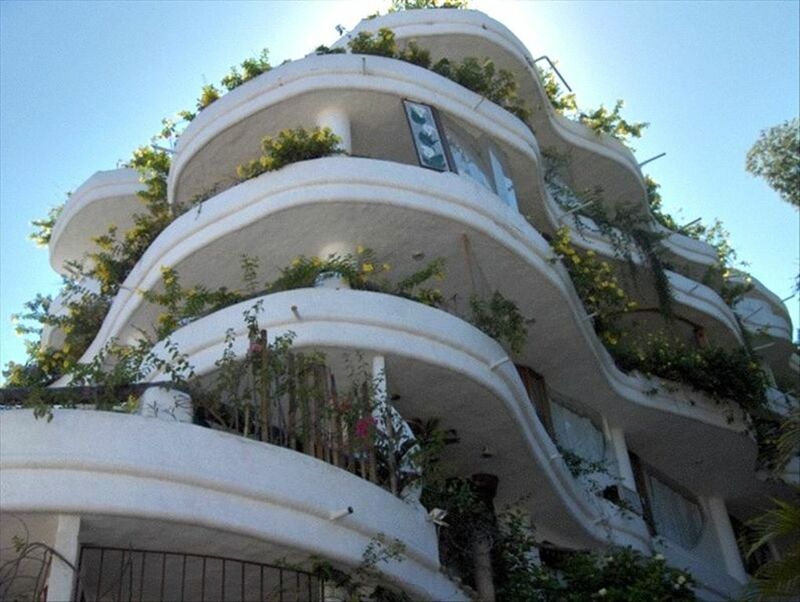 CASA TUCAN is one of eleven suites in the distinctive Villa Blanca condominium, renowned for its organic design by Mexican architect Diego Mendez De La Penas. Variously known as “the Piano Building” or “Vallarta’s Wedding Cake,” Villa Blanca remains one of the most architecturally distinctive buildings in Puerto Vallarta, and is widely recognized for its lush plantings and spectacular rooftop view. Each unit in Villa Blanca is privately owned, and the building is serviced by a friendly and helpful manager fluent in English. Housekeeping service is included and available Monday - Saturday, and a security guard is present after dark. CASA TUCAN is a LUXURIOUSLY spacious (MORE THAN 850 sq. ft.!) TRUE 1-BR, 2-Bath suite, perfect for short or long-term rentals! Quietly situated away from common areas. The unit includes a full kitchen (sans oven), dining area, LR w/2 large sofas (each can sleep 1 adult), Private BR w/King-size bed, and 2 full Baths complete with large tiled showers. CASA TUCAN is a private retreat awash in light, and features its own PRIVATE TERRACE/LANAI, unique among 1-BR and studios in this building..
Additional amenities include the beautiful cooling pool at the building entrance patio, which offers a welcome respite from the glorious Vallartan sunshine. And the rooftop terrace is a haven for quiet sunsets or evening gatherings, offering a spectacular panoramic view of Banderas Bay from Los Arcos to downtown Puerto Vallarta. The rooftop terrace also features a traditional Mexican grill and outdoor bar/kitchen area. For one of Vallarta’s most glorious beaches, cross the cobblestone Amapas Street, and you're less than 100 steps down to the beautiful Playa Los Muertos, with sand, surf, people-watching and an abundance of beach cafes, including the famous Blue Chairs Beach. CASA TUCAN is centrally located in the Zona Romantica, and just a short walk to everything the Old Town and Olas Altas areas have to offer, from shopping to clubs and fine dining. Just minutes south of Casa Tucan lay numerous small, secluded beaches, and the area abounds in charming day-trip destinations rife with local color and culture. Whether you’re searching for a quiet romantic retreat, or an evening spent sipping martini’s in a luxurious cabaret lounge, Zona Romantica offers a quieter alternative to the bustle of Nuevo Vallarta and the Marina district. Check availability on our calendar below and make Paradise yours! LUSH JUNGLE view from the sunset terrace...quietly situated away from the road, and just 100 steps to Playa Los Muertos below. Efficient, quiet, remote controlled European split unit in BR cools entire unit! Ceiling fans in both LR and BR. Beautiful linens with daily Maid Service! Wired ethernet access in condo. Secure wifi in condo and throughout building. Full-size refrigerator with freezer....stock up on essentials at the local Grocery store, just 2 blocks away! Custom island in kitchen seats 3, dining table seats 4, and terrace table seats 2. New flatscreen HDTV with 30+ local and international stations, including English-language channels. iPod/MP3 docking station in LR. Also accessible from your Bluetooth accessible mobile phone or tablet. A variety of titles, including local tour guides, hand selected by the owners, and updated regularly. Includes large array of travel guides for the both local area and all off Mexico. Compact bookshelf system with CD, radio tuner, and MP3 hook-up for your I-Pod or other music player. Two beautiful tiled decks for public use, including the calming pool deck and the beautiful rooftop terrace with sweeping views of Banderas Bay! This beautiful newly tiled fresh-water Infinity Cooling Pool provides a welcome respite after aday at the beach...looks out to Amapas -and a peekaboo view to the playa. Perfect for a Happy Hour dip! Beautiful original and indigenous art throughout unit, In-Room library including Numerous current Tour Guides, Street parking available, Taxi stand nearby. Full Kitchen: Gas stove top (less oven), Bottled water available on-site, Microwave/Toaster/Toaster Oven/Blender/Coffee Maker, Lush JUNGLE view from our terrace, and the Roof Top Terrace offers a sweeping Banderas Bay View and its glorious sunsets. This large terrace is the perfect spot for sunbathing or entertaining, complete with bar area, Mexican Charcoal BBQ, and seating and dining areas. Hairdryer in large bathroom, In-Room Lockbox Safe, Iron and ironing board, snorkeling gear, beach chairs and umbrella. We had another wonderful stay at Casa Tucan. The property manager, Jose Luis, and the house keeping staff were very friendly and welcoming. This trip we ended up eating at home more. There is a great little store in town called Mikey’s that have a great selection of cooked foods and cold salads which made for a lovely meal in. We also were able to enjoy the Saturday Market where there is a woman who sells her home-made tamales. Amazing!! With all the changes that are happening to Puerto Vallarta, it’s nice that there are still some familiar spots and we look forward to staying at Casa Tucan again next year. Thank you Rob and Daniel! It’s the second time at the same place. We enjoyed again. Comfortable 1 bedroom apartment with 2 full bathrooms, functional kitchen with all amenities and a small balcony suitable for dining. Staff are very kind and helpful. Like everywhere in PV, music and construction are prevalent; must be able to climb stairs. Views of lush greenery and ocean view from the roof deck. If you are a late sleeper, you may want to bring a mask. Enjoy. This place is grate! Everything you need to make your vacation awesome. It feels like you’re at home away from home. It is quiet and very comfortable. I definitely recommend it! If you want an accomodation that gives you convenience of beach, restaurants, and shopping all within walking distance, this is where you are looking for. Take in mind there are hills in the said walking distance, but consider that to be a free work out. This is a charming older building that has really interesting architecture and amazing foliage outside the little patio. The bed is very comfortable and the kitchen has all the amenities that you could want. The apartment is perfect. The negative reviews below are more than likely some one else’s over expectation of what Mexico should be like. You’re wanting to stay in old town, not an all-inclusive in Nuevo. Take all the reviews in mind like we did and you will have an awesome time in the Zona Romantica at Casa Tucan. Many thanks to our hosts, Rob and Daniel, we hope to stay with you again. My best vacation experience ever. The property was gorgeous in and out and best location. Near to the beach, bars and restaurants. Sad that I have to live so soon. Be sure to check out the FABulous shows at the nearby Cabaret/Martini Lounges, the Act II, the Palm & Garbo's! Contact owner for additional SPECIAL DISCOUNTS for extended stays longer than 14 days! A deposit of 25% is due at the time of booking. If reservation is cancelled, this deposit is nonrefundable. Remaining balance is due 60 days prior to arrival. If the reservation is cancelled within this 60 days, the 25% deposit is nonrefundable and the remaining will be credited based on the rebooking of the suite. Deposits are subject to nominal bank wire fees.